Product prices and availability are accurate as of 2019-04-12 02:52:44 EDT and are subject to change. Any price and availability information displayed on http://www.amazon.com/ at the time of purchase will apply to the purchase of this product. 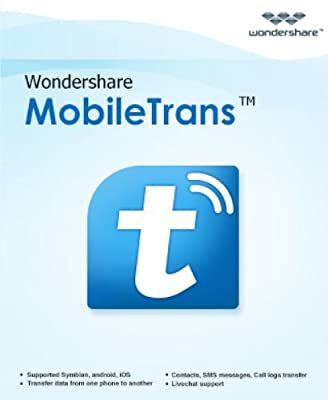 Wondershare MobileTrans is a powerful phone to phone transfer utility tool. It supports transferring contacts, text messages, call logs, calendar, photos, music, video, apps and app data between iPhone, Android, Windows Phone, Nokia (Symbian) phones and BlackBerry with in one click. 1-Click Phone Transfer, 100% Safe and Risk-freeWhether you're planning to upgrade to the latest model, or switching to a different system or carriers, only some smart phone companies might help you to transfer contacts. You have to figure out the way yourself to deal with the other files and data. Wondershare MobileTrans is the right tool that makes the transfer process extremely easy with simple steps. With the help of the transfer program, you can handle every kind of files yourself including contacts, photos, text messages, music, calendar, video, apps and call logs. It's safe and risk-free. 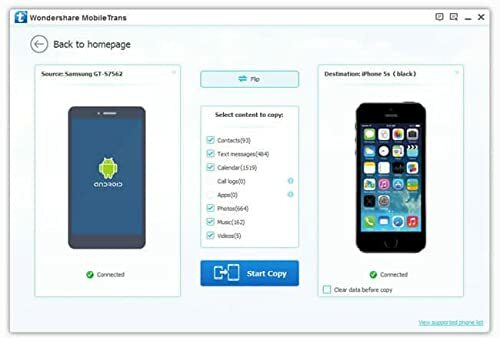 Transfer Content between iOS, Android, WinPhone and Nokia SymbianThere are different tools that could one-way solution, such as the “move to iOS” developed by Apple and switch to android by Google. 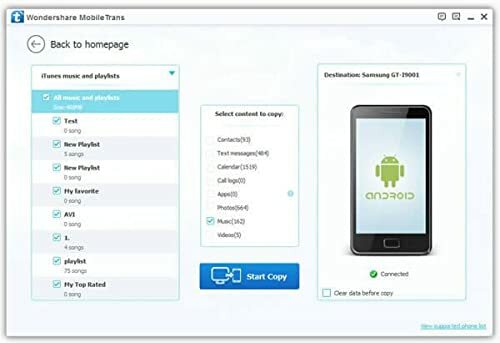 What’s special about Wondershare MobileTrans is that it does well in transferring content between different smart phone operation systems including iOS, Android (fully support Android 6.0 Marshmallow), Windows (including Windows 10 for Mobile) and Nokia Symbian. Besides, when transferring contacts, it does not just transfers names and numbers, but also move job title, email address, company name, and all the info you add in the contact list. Support for 3,000+ Phones and Different NetworksIt works perfectly with Apple, Samsung, Nokia, HTC, LG, Sony, Google, HUAWEI, Motorola, ZTE, and more mobile models. Additionally, it's fully compatible with major providers: AT&T, Verizon, Sprint and T-Mobile. Permanently Erase Your Old PhoneDecide to sell or donate your old Android phone, but want to keep your personal data out of the wrong hands? Wondershare MobileTrans helps to protect your personal data by erasing all of them from your old Android phone, safely and permanently. Erase Your Old Phone: Wipe off everything on your Android phone in 1 click. Multi kind of data and files can be transferred including contacts, SMS, photos, music, videos, apps, call logs, etc. When transferring contacts it moves the whole contact info including names, job titles, email addresses, company info, and all the content listed in the contact list. 2000+ phones supported including: Android devices (including Samsung, HTC, etc. ), iOS devices (iPhone/iPad/iPod), Windows Phones (including Windows 8 and Windows 10) and Nokia (Symbian). It supports transferring content between different contract phones by AT&T, T-Mobile, Verizon, Sprint, etc.